The Delaware Nature Society Native Plant Sale (May 1- 4) theme this year is “Inspired Plant Combinations: Create Your Garden Masterpiece”. Got a spot in your garden that needs some POW? We can help! When considering buying new plants, first note the light and soil moisture conditions where you want to plant. Second, consider how much space (height and width) you want the new plant to fill. Our plant sale catalog gives you all the information you need to make the right plant selections. If you are starting from scratch with a new bed, you will want a combination of plants…maybe a small tree, a few shrubs and some groundcovers. If you are adding plants to an existing bed think about what is already there, what type of garden interest are you trying to achieve, and how will your new plant fill that role? A female Ruby-throated Hummingbird visits Monarda in a backyard garden. Photo by Hank Davis. Back to that POW! One of the most exciting wildlife experiences in the garden is when you have a visiting Ruby-throated Hummingbird. Below is a list of my favorite plants to attract the Hummingbirds. They all flower in shades of red, orange & deep coral pink. How is that for POW? Trumpet Vine, Campsis radicans, really swallows up a feeding hummingbird. Photo by Hank Davis. Ruby-throated Hummingbirds arrive in Delaware in mid-April and are residents through the summer. In the fall, you will see an increase in their numbers since young birds are around and fall migrants are visiting our area. By October, they are virtually all gone with the exception of a straggler or two. Knowing this, you can plan to have a succession of blooms for them. Add a sugar-water feeder to your garden for supplemental food, and be sure to clean the feeder regularly so that the water doesn’t spoil and make them sick. Boil a solution of 4 parts water and 1 part sugar so that it keeps in the fridge longer. Replace the solution at least once per week, and at the same time, clean the feeder with a 10% bleach/water solution. This way, your garden hummingbirds will be happy and healthy. Additionally, if you really want to spoil them, you can provide a “mister” that creates a fine mist of water that hummingbirds love to bathe in. Of course, Cardinal Flower, Lobelia cardinalis, is a well known and popular hummingbird attracting plant. The reason? It works! Photo by Hank Davis. Plant enough of the perennials to create a good-sized patch, so you will get their attention. Vines should be planted on a mature deciduous tree (like an old Wild Cherry) or a very sturdy structure. For additional interest in the fall and winter, add a few Winterberry Hollies (Ilex verticillata both male and female) or Red Osier Dogwoods (Cornus serecia) and underneath it all, plant with Green-and-Gold (Chrysogonum virginianum).By adding a few of these native plants, your yard should be humming with activity all summer long. Excited for spring yet!!! Ruby-throated Hummingbird: All Grown Up! On Saturday, June 18, our class from the Naturalist Certification Series visited Coverdale Farm Preserve for a bird walk. Lots of great birds gave us plenty to appreciate, from Orchard Orioles to Indigo Buntings to Yellow Warblers. 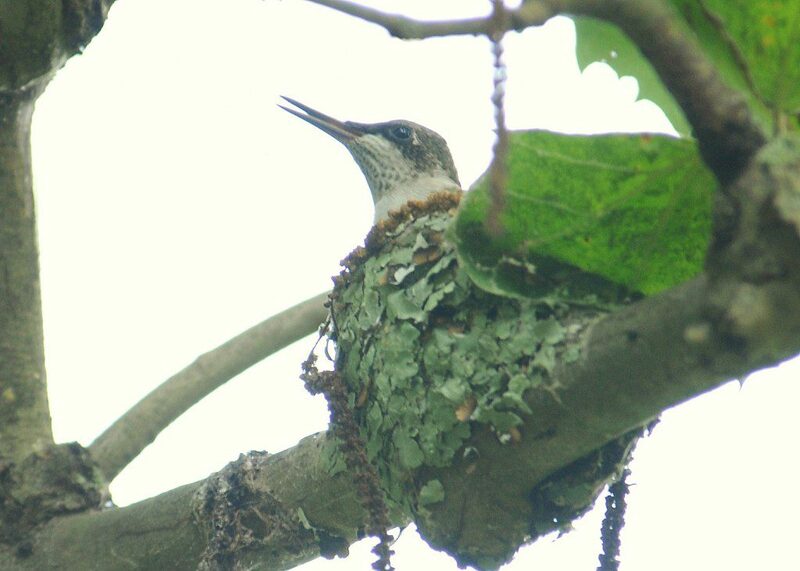 The Ruby-throated Hummingbird nestling sits high in the nest, in the final day before fledgling. This is the last photograph of this bird in the nest. Image by Derek Stoner, June 18, 2011. But the star of the show was the baby Ruby-throated Hummingbird, sitting in the nest where for the past three weeks he (or she?) has grown up on a branch of a Sycamore tree. Our group of curious onlookers gawked at the hummingbird 20 feet above our heads. With beak held apart, it appeared that the hummingbird was panting to keep cool in the late morning heat. Everyone enjoyed the thrill of seeing the “baby” in its nest, and we had to look carefully to realize that this was indeed the youngster and not one of the adults sitting on the nest. The slightly shorter beak and speckly plumage on throat convinced us of its age– a mere 19 or 20 days! I told our group that the hummingbird would likely fly away and leave the nest for good within a day or two. Sure enough, this morning(June 20) when I went to check one final time, the nest was empty. Through monitoring the nest over the course of five weeks and a total of five visits, I’d grown accustomed to excitement of seeing something alive within the nest. I feel honored to be able to document such an interesting sequence of events in the development of a hummingbird, from egg to fledging stage. I hope you enjoyed the show as much as I did! A male Ruby-throated Hummingbird hovering at Ashland Nature Center. Photo by Amber Wible, June 16, 2011. As we celebrate Father’s Day today, here is a perfect image to illustrate the day: a male Ruby-throated Hummingbird in full color! Male birds often are more colorful than females, and male hummingbirds in particular are known for their brilliant colors. 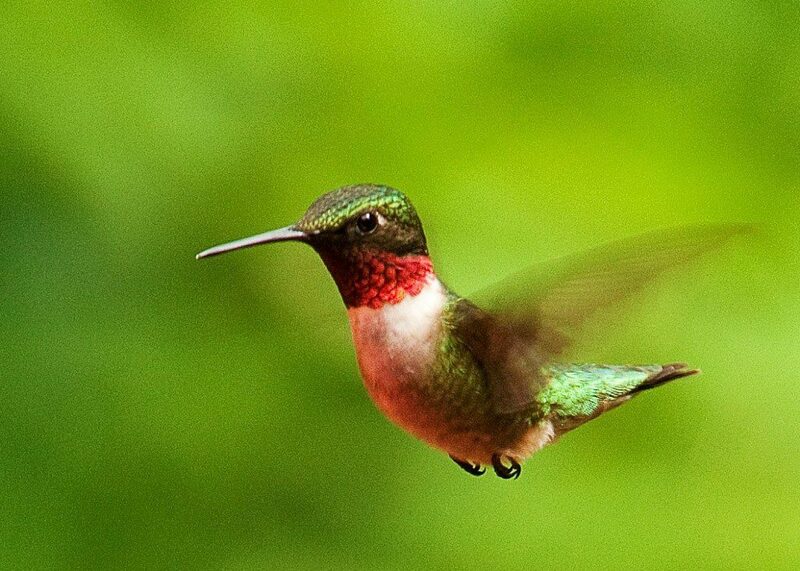 Hummingbirds are known for their iridescent feathers, and the throats of male Ruby-throated Hummingbirds give the species its name. This colorful patch of specialized feathers is known as the gorget, and in the right light, makes the throat look like a blazing red ember. This wonderful photograph was taken this past week in the Outdoor Images and Moviemaking summer camp by Amber Wible, a fourteen-year-old with great talent for photography. Certainly her father can be proud of her skills! Ruby-throated Hummingbird: About to Fledge! 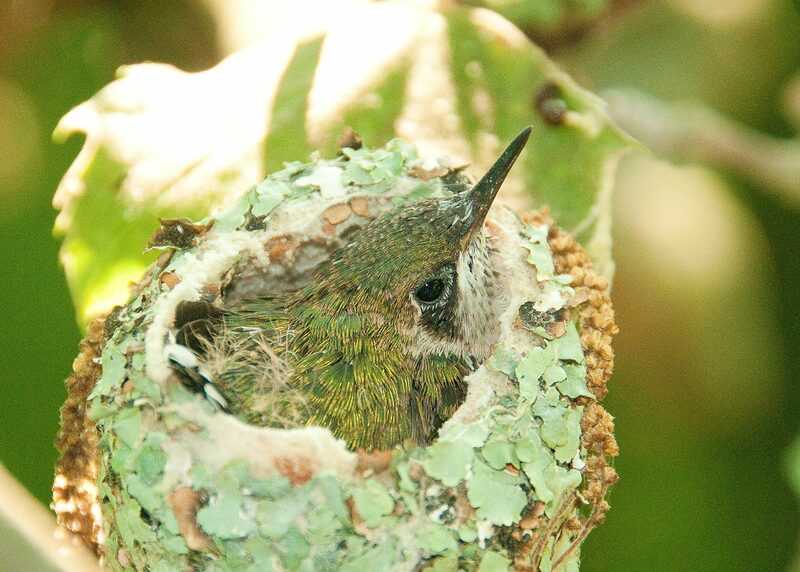 A Ruby-throated Hummingbird nestling, about 15 days old, in its nest at Coverdale Farm Preserve. Image by Derek Stoner, June 15, 2011. On June 15, I visited the Ruby-throated Hummingbird nest at Coverdale Farm for the third Wednesday in a row. 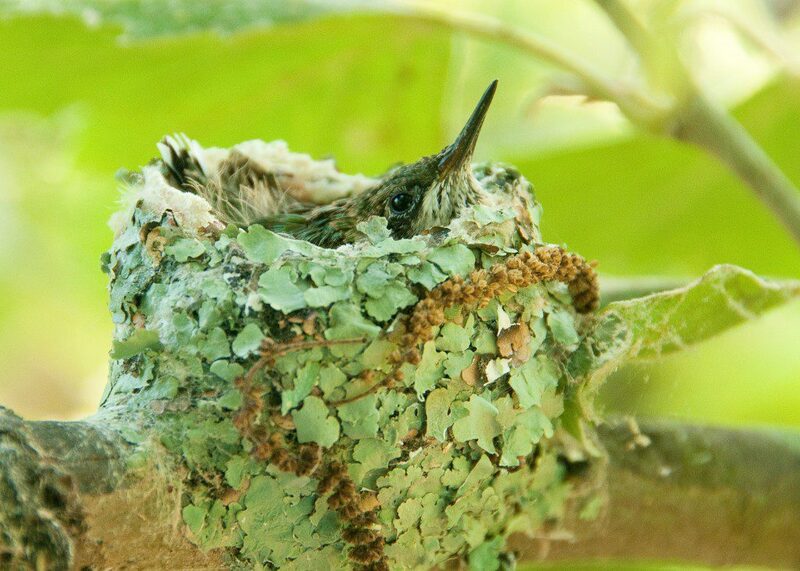 At this point, the nestling hummingbird is an estimated 15-16 days old and looks much more like an adult hummingbird. The beak looks to have grown an additional quarter-inch in one week. Notice the bit of yellow color in the corner of the hummingbird’s beak (the gape flange) that is a common feature of young birds. The nestling Ruby-throated Hummingbird in mostly-adult plumage, but still showing a few tufts of down feathers on its back and tail. Image by Derek Stoner, June 15, 2011. In the past week, the pin feathers on the hummingbird’s back grew out and are now fully-formed feathers exhibiting the classic iridescent greenish-gold hue of an adult hummingbird. There are just a few remaining buff-colored down feathers on the uppertail coverts, soon to be dropped as the tail feathers grow out and the bird prepares for its first flight. Stay tuned for one final update on the hummingbird, before it fledges and makes its first flight!